Is it currently possible for a developer to change the wording used on a game's download pages? Specifically we were wanting to change the "Name your own price" text on the main game page and the "This game is free but the developer accepts your support by letting you pay what you think is fair for the game" text on the download page. I've looked through all the settings I can find, but there's nothing obvious I can see to let you edit those bits of text so I assume they must be generated on the back end? I've highlighted the text I mean in the images below. There's no way to change it right now. What are you looking to change it to? Here's the text we'd like to substitute. I've made sure they use the same number of characters or less so they shouldn't mess up any of the existing page formatting on the site. On the first page we'd like to use "Donations welcome" instead of "Name your own price". And on the second page we'd like to use "This game is free but the developer welcomes donations if you enjoy their work and would like to show your support" instead of "This game is free but the developer accepts your support by letting you pay what you think is fair for the game". Everything else would remain exactly as is. I hope that's okay? Ah, okay - thanks for confirming that. I'm not sure exactly what we'd need to change it to yet, but if you think it would be possible to modify then I can find out and let you know the wording? Bit of background - we were wanting to change it to something that makes it totally clear the game is free and that any payment a player chooses to make is a voluntary donation that helps support the team, rather than being a purchase of the game itself. At the moment the text is a bit ambiguous and can be interpreted as if players think they are paying for the game, e.g. "letting you pay what you think is fair _for_ the game". By linking the payments to the value of the game our tax authority here in the UK is arguing the payments should be classified as sales rather than donations, and that means we need to pay sales tax at 20% on all the donations we receive. We've tried reasoning with them but they're giving us the distinct impression they're not particularly sympathetic to our argument, hence we thought it would be easier just to change the text rather than continue arguing. That way there's no way they can insist people think they're paying for the game. that's an intriguing question. if there's a difference regarding taxes, shouldn't that be handled properly? 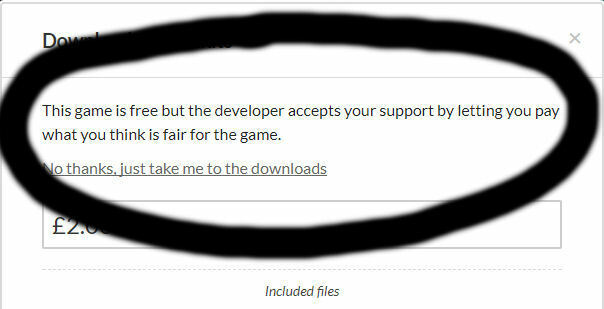 maybe treat as donation if the game is free with no additional download and/or the minimum is set to $0? there are a lot of these around, so that could have a huge impact on the site (also regarding the vat handled by itchio). (edit) digging a little, it seems donations are subject to a 60% tax on my side! the other way around then: I'd have to make it an actual sale by providing something more to people who "donate"... how does it work on itchio's side?